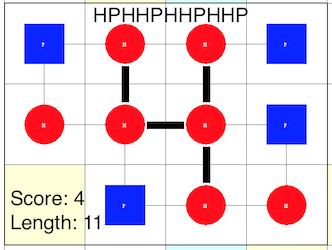 2D HP folding problem: implementation of an exhaustive search algorithm. This project started as an assignment for the university. The task was to implement, in C++, a backtracking algorithm that solves the protein folding problem in the 2D HP model. The Hydrophobic-Polar model is a simplified model proposed by Ken A. Dill in 1985  in which the proteins are represented by a sequence of two types of amino acids: Hydrophobic (H) and Polar (hydrophilic) (P). 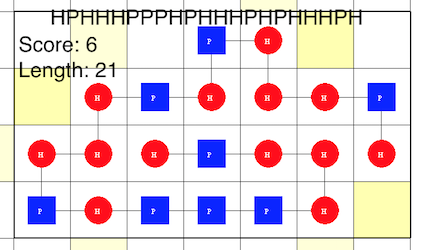 The 2D HP folding problem consists in finding an “optimal” conformation, in a 2D grid, of a protein represented by a sequence of ‘H’s and ‘P’s. The optimality of a conformation is defined by its score: the number of hydrophobic (H-H) bonds (number of H’s that are neighbors on the grid but not in the chain). A conformation is optimal if there are no other conformation for the same protein with a higher score. 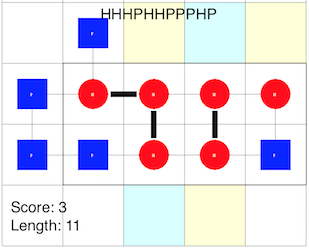 The following images show some examples of optimal conformations with their scores. The HP Folding problem was proved to be NP-Complete in both its 2D and 3D versions . I chose to base my work on this paper  which describes an exhaustive search algorithm with 6 pruning criteria. A more detailed explanation of the implementation is available on the github repository of this project, along with benchmarks and build instructions.